I guess most ladies know about this brand 3 Concept Eyes ( 3CE ) which is a Korean make up brand founded by Style Nanda. I bought and started my first 3CE product back in late 2012. My first buy was a lipstick. And as time goes by , my collection grew to 10++ bottles of nail polishes , brush set , blushers , concealers , highlighters , face glow , eye cream shadows , lipsticks , lipglosses , eye shadows and more. Basically , i had the basic make up products from 3CE. The nail polishes are free when i order them from the website. I remembered queuing for half an hour just to pay for the products at its flagship outlet in Hongdae. What i like about 3CE is the very “M.A.C-ish” kind of packaging and impression. The colours are bold and alot of variety. They keep coming up with new colours just like any other Korean brands. Koreans like to play around with lipstick colours so you can find a huge range of lipstick colours when you shop at Korean beauty brands. Here is part of my humble collection of products from 3CE. The rest such as the nail polishes , foundations and concealers were kept in a pouch because i seldom use or don’t use them anymore. After using most of the basic 3CE make up products , i have to say that their lipsticks , shimmer sticks and lipglosses are worth buying because they are good. I find their blushers so so only and their waterfall concealer is moisturizing but i was kinda shocked to see a “clear liquid” and the concealer oozed out of the concealer tube when i squeezed it. The clear liquid was kinda oily. The concealer doesn’t really cover up my eye rings. The Banila and Co and Nature republic ones cover better. The face glow was abit too creamy and oily that i felt my face is kinda oily after applying it. So i stopped using their concealers , face glow and foundation. I am currently using their face shimmer stick and lipsticks only. The brushes are ok except for the blusher brush which can’t really “sweep” up the powder from the blusher. If you would like to try products from 3CE , i will suggest that you start from their lipsticks first. Oppa just got me some Mizon lipglosses. I haven’t get to use them yet and will review it soon ! Im still faithful to my Tony Moly Spring Orange lipstick and i am into my 4th stock within 1.5 year already ! 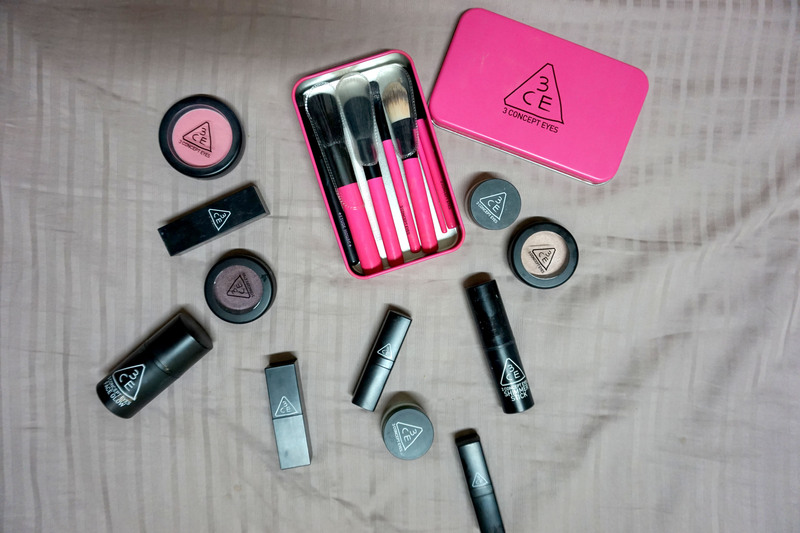 This entry was posted in 3CE, Korean MakeUp and tagged Korean, Korean MakeUp.